So, after I made the card in the previous post for the Moxie Fab World Glimmer Spray challenge, I had some spray left on the mask. So, I put the mask spray side down on a scrap of cardstock, and rubbed it to get the ink off. My main goal was just to clean the mask. But, as soon as I saw the end result, I thought it would make a cute card on its own! So, I grabbed a felt butterfly from my scrap bin, some more of the baker's twine that was still on my desk and a scrap of the patterned polka-dot paper. And, voila...another card was born! I hope you enjoy it. Another great challenge over at the Moxie Fab World Blog...to use shimmer sprays! This is another one of those supplies that I have had around for several months, and have only used minimally. I did use the shimmer sprays on plain white trims for my Christmas cards this year. But, I think I had only made one scrapbook page here and some Valentine's cards with the sprays. These are becoming more fun to play with. I think the more I see them used, the easier it is to picture how I want to use them. Anyway, I actually made two cards for this challenge, but I'll just tell you about the first one here. I was looking through my stash of masks, and found this fun flower mask from Heidi Swapp. I immediately thought of using it with the sprays, and then putting baker's twine in big loops over that background. I really like how this turned out. I hope you do too! Getting Daring with Decorative Tape...Again! I had so much fun making the card in the previous post, that I decided to make another one using tape. This was part of the challenge over at the Moxie Fab World. This card uses some of the same tape as the other card, but I also opened up the fabric tape. This stuff is really addicting! The flower embellishments I made myself with felt, stamped and inked papers and big brads. These are addictive also. I hope you enjoy this project! I was so glad to have this challenge to use tape! I bought some last summer ad the CHA show in Chicago, and hadn't used it at all. So, when this challenge came up over at the Moxie Fab World blog, I decided to play along. I really like the vivid colors of the tape, and how it looks after it is applied. I might have to get a few more colors to round out my collection now! Anyway, I hope you enjoy the card, and even join in on the challenge. 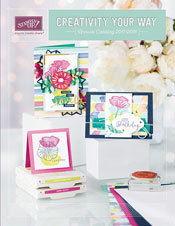 I love the big rose included in the Year of Flowers Roses Papertrey Ink stamp set. So, I decided to use this set to make a card for today's challenge of using something megasized on a card. I used Twinklin H20's to paint the rose and leaves with, and some Basic Grey patterned paper as the background to the rose. I hope you enjoy this project! I loved the first Make It Monday card over at Papertey Ink in honor of their anniversary celebration. I though I would play along as well. At first I was going to make the background sentiment stamping in multiple colors, but in the end I decided to keep it as a simple monocolor background. I hope you enjoy! I finally had some time to play along with one of the Papertrey Ink challenges for their Anniversary. Today's challenge is to use buttons in a creative way. I know I have seen this idea before, but it was the first thing I thought of for using buttons. The buttons are Papertrey Ink Raspberry Fizz color. Also, I used a Sizzix die with a small stamp diecut. I cut the stamps first out of thin chipboard, and then out of paper which I glued to the chipboard. See below for the rest of the supplies.